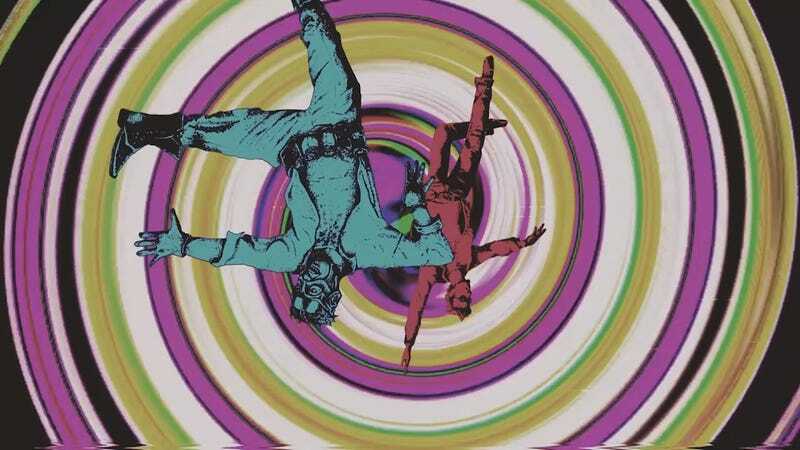 The final sequences of Travis Strikes Again have some interesting twists for fans of Grasshopper Manufacture’s games who might want to know what’s coming next from Goichi Suda’s studio. If you want to experience them for yourself, read no further! If you’d rather get spoiled, this is for you. Travis Strikes Again: No More Heroes, out today for Nintendo Switch, consists of levels presented as individual “virtual reality” games that are played by acquiring items known as Death Balls. Travis finds new Death Balls during sequences that play out like old-school computer adventure games. Any comparison one might draw to one John Riccitiello, who is now the CEO of game engine company Unity and was the CEO of Electronic Arts when the company published Grasshopper’s 2011 game Shadows of the Damned, is, I am sure, totally coincidental. Travis gets the Death Ball from Riccitiello, which is said to contain an RPG called “Serious Moonlight.” But once he starts playing it, it turns out to actually contain a game called “Damned: Dark Knight,” which, yes, is a pseudo-sequel to Shadows of the Damned, a real-life Grasshopper Manufacture game that apparently also exists in the fictional world of No More Heroes. Throughout this level, Travis gets to meet up with Shadows protagonist Garcia Hotspur and his talking gun Johnson. The sequence also seems to break the fourth wall a bit by hinting that a new port of the game might be on the way, or that we may even see the future adventures of Garcia at some point. After “Damned,” there’s one final level between you and the game’s ending. I won’t spoil what gets revealed in it, even though we’re deep into spoiler territory here, because it doesn’t contain anything I’d consider newsworthy. But there’s also a post-credits stinger that—again, if we’re taking the game’s fourth-wall breaking as an indicator of real-life happenings—teases No More Heroes 3. The scene closes on the No More Heroes logo. So, what’s real, and what’s fiction? “TSA is a game commemorating Grasshopper Manufacture’s 20th anniversary, so it contains a handful of cameos from previous Grasshopper characters, some of which are featured largely as with Shadows of the Damned,” said Suda in a statement emailed to Kotaku.